The Chilean film No chronicles the story behind the advertising campaign for the referendum to force Pinochet, the dictator, to hold elections. In 197x Chile held an election to determine whether to hold elections for the head of state. Should Pinochet keep his position or would he have to run to stay in office? Each side was given 15 minutes of TV airtime a night for the 27 days leading up to election day. The Si side was pro-Pinochet and No was in favor of ousting him via and election. While the No backers expected a straightforward campaign showing all Pinochet’s atrocities, the ad exec thinks that’s too much of a downer, that they should go for exuberant like Coca Cola, etc. 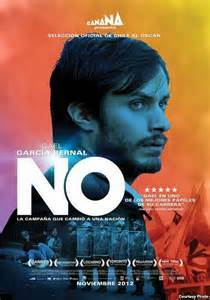 In addition to this conflict, Pinochet’s hoodlums follow and intimidate the people working on the No campaign.